New in September 1990 one of four Mercedes 709D bread vans purchased. Two like this one with Reeves Burgess bodies whilst the other two had bodywork by Wadham Stringer. Large numbers of Plaxton (owners of Reeves Burgess) bodied buses followed to the same design. I am sure very few people, passengers or enthusiasts alike would call these buses their favourites but they have served a very useful life in Plymouth. Perhaps their greatest fames is that they saw off the awful Renaults before them. 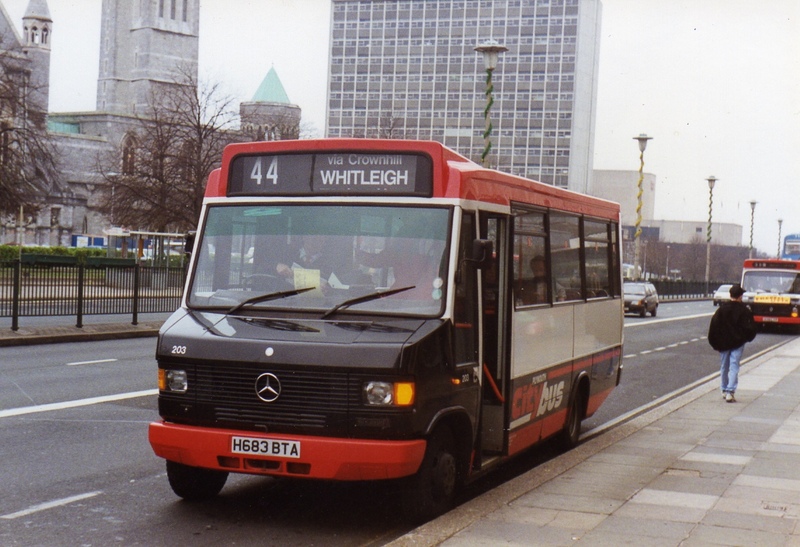 The early first half of the 1990’s were rather boring for Plymouth in that both Citybus and Western National were buying almost identical buses. Plaxton bodied Mercedes bread vans and Dennis Darts for both companies.